With all this talk about MOOCs, we wanted to hear from someone who had deep experience with open courses long before the idea was discovered by the elite universities. 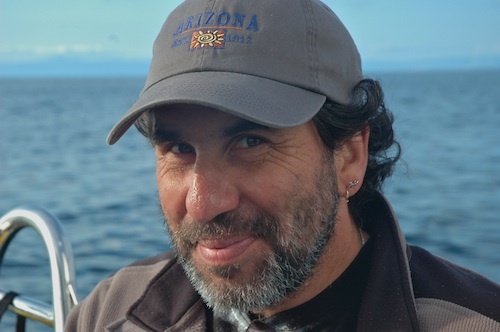 Guest blogger Alan Levine most recently was instructional technology specialist at the University of Mary Washington, following leadership positions at the New Media Consortium and the Maricopa Community Colleges. Currently he is exploring new options under the banner of his own creation CogDog.it. Through his Open Digital Storytelling class, you find concepts that can be used by an educator to reach a “massive” (or as large as you wish) audience. We appreciate Alan’s humor and the titular reference to the closing line of the film “The Maltese Falcon.” In response to the question “What is it?”, Humphrey Bogart answers “The stuff dreams are made of“. Started in 2010 by University of Mary Washington (UMW) instructional technologist Jim Groom, this course broke away from the typical digital storytelling approach of video personal narrative, to framing storytelling as something that is based on and part of the culture that is the world wide web. Students at UMW are tasked with setting up their own domain and managing a WordPress blog, part of the personal cyberinfrastructure idea envisioned by Gardner Campbell. The course explores not only the methods of creating visual, audio, and video media forms, but explores issues of digital identity, copyright, remix, and internet culture. It is less a statement of what digital storytelling is then an exploration of what it is as an ongoing query. After presenting at the 2010 Instructional Technology Council’s eLearning conference, Jim was asked “why don’t you open up this course for others to participate?” Influenced by the open network structure of the 2008 Connectivism and Connective Knowledge course (which gave birth to the MOOC acronym) thus was born ds106, the open course. Built on a platform of open source technologies WordPress and the free FeedWordpress plugin, ds106 operates in the very distributed manner of the internet itself. Our primary channel of communication is a #ds106 hash tag in twitter plus our own internet radio station, built by participants,. All participants in the experience, registered students at UMW and several other institutions plus open participants, submit a URL for their blog that is syndicated into ds106. Currently, courses at the University of Michigan, Kansas State University, and York College/CUNY run parallel courses that tie into ds106. This means whenever someone publishes new content on their own site, ds106 gets a copy and all links on the ds106 site point back to the source. Our site currently subscribes to over 600 external blogs, and unlike your garden variety LMS, we never throw away previous work. We have aggregated over 23,000 blog posts. This is a construct we refer to as the “syndication bus.” It has been used in several other open courses, including Entrepreneurship in Education, Project Community, and the Educational Technology MOOC currently in progress. Participants in ds106 also build the course with us. Like EDS, we like to build planes in the air. The ds106 Assignment Bank houses much of the work we give to students to do, includes 500 creative activities contributed by participants and a Daily creative challenge site also populated by participants. Unlike other massive online open courses that are all the rage, ds106 does not attempt to replicate the same learning experience for every participant – nearly all MOOCs attempt to scale arithmetically. What our UMW students do overlaps with the other courses and what open participants choose to do, but there is no single ds106 course for all. In fact, it is more community than course. The syndication bus is a distributed network model, not a centralized one. There are no registrations or logins required to access ds106 content. 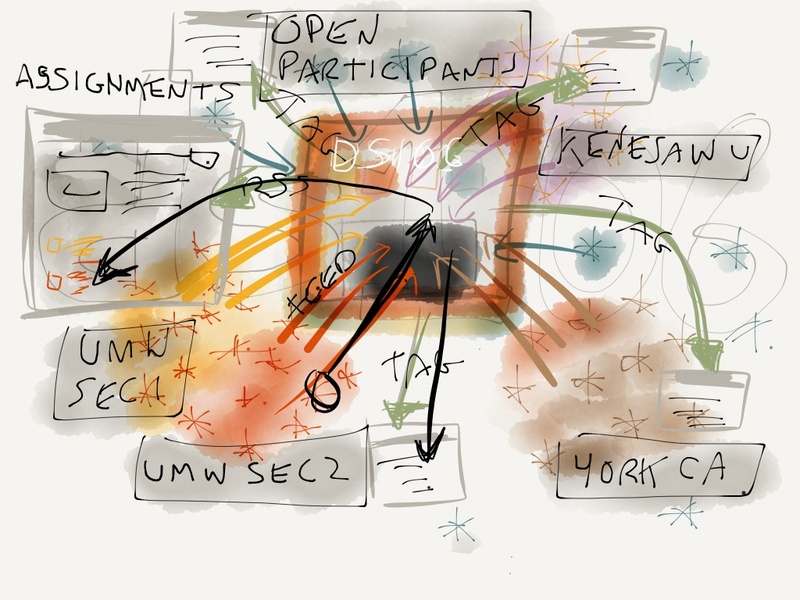 For a presentation at the Open Education Conference in 2012, I attempted to carefully diagram the structure of ds106. I failed. I found a much better image that represents the way ds106 is designed. 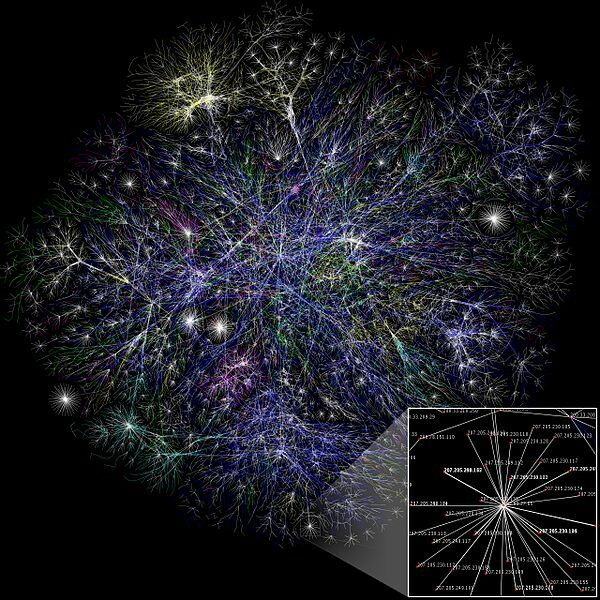 The very essence of ds106 is that it is made of the same stuff that the web is made of, a distributed, open, decentralized connected network managed by participants in the space it inhabits. You will hear people talk about their organizations or projects being on the web. but there is more than a shade of difference of ds106 being of the web. When Paul Baran proposed the radical idea of a communications network based on data being broken down into small packets, and routed through this distributed network, assembled on the receiving end, his ideas were ridiculed by conventional engineering wisdom of the day. The telephone companies that had built existing networks insistedthat connections needed to be open point-to-point to be reliable for the duration of a communication transaction. Luckily for us, the packet switching model won out over the long run. In an environment that has proven its resilience, growth, and capability, should we not emulate the very ideals of the internet in the learning experiences we create? For the most part, while being on the web, the majority of MOOCs are operating via a structure that is not built by nor cared for by its learners. The truly open, syndicated model of ds106 works because it acts like the web itself. I am not just arm waving at the stars here; see a timelapse reconstruction of the ds106 galaxy created by Martin Hawksey, a JISC/CETIS researcher, who created a visualization based on the export of our WordPress database processed with NodeXL. The ds106 Quick Start Guide. 10 Ways You Can Be Part of ds106 Without any Cruddy MOOC Drop Out Feeling. Frankly I like citing Sam Spade. However well it works as information, your watercolor diagram is quite lovely. For those who have never looked at this course, you should. It’s fascinating and the participation of ‘outsiders’ to the student population is often quite to the point from a commercial perspective. It was, indeed, an early MOOC – unsung by the media hype surrounding currents ones!